Patients count on doctors, nurses and medical staff to keep them healthy. 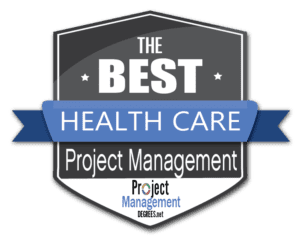 Healthcare project managers are just as essential in maintaining the financial health and institutional viability of healthcare organizations. Project managers working in the healthcare industry face a unique set of challenges. In addition to the expertise in methodologies, leadership, administration and management required of any project manager, those performing healthcare administration or management must also have specific expertise within that industry. Such knowledge includes healthcare law, finance, insurance, quality control, analytics, and information management. In addition, new developments in healthcare technology, data collection, law and treatment make this a particularly dynamic field. A Master’s in Project Management Healthcare is therefore an in-demand degree which indicates an advanced level of specialized expertise. The Bureau of Labor Statistics (BLS) reports that the field of healthcare management is one of the fastest-growing in the nation, thanks in part to the continuing expansion and diversification of the healthcare industry. In fact, the BLS projects a 23% growth in jobs for medical and health services managers from 2012 to 2022, far ahead of the national average. Such positions are also lucrative, with a median salary of $98,350 per year. An online Master’s in Project Management Healthcare is an excellent way to qualify for senior and leadership roles in this fast-growing field. Such programs are not only more flexible than their on-campus counterparts, they are typically more affordable as well. And you won’t have to sacrifice quality, as the best master’s degree programs offer comparable class sizes, retention and graduation rates. Our ranking of the 10 Best Master’s in Project Management with Healthcare Concentrations brings you the best of the best, analyzed and ranked on the qualities that matter most: affordability, flexibility, and academic quality. Stevenson University is a private institution of higher education which has three campuses in the Greenspring Valley area of Baltimore County, Maryland, including one in Stevenson and two in Owings Mills. The school was founded in 1947 by the Sisters of Notre Dame de Namur, a Roman Catholic women’s religious order, as “Villa Julie College,” a one-year school training institute aimed at preparing women for careers as medical secretaries. The school became a two-year college 1962, became independent of the Sisters of Notre Dame de Namur and the Roman Catholic Church in 1967, and became coeducational in 1972. Today, the school serves 4,185 students and is the third-largest private university in Maryland. Stevenson offers a unique blend of liberal arts curriculum with career-oriented studies. The school awards a total of 28 career-focused bachelor’s degrees, and delivers both undergraduate and graduate degrees online, with a focus on providing flexible degree paths for working adults. An innovative “Career Architecture” is interwoven throughout the curriculum, providing students with formal training for workplace success, including skills in interviewing, resume writing, and experiential learning like co-ops and internships. As a result, Stevenson has a high job placement rate for graduates, with 97% employed within six months of graduation. U.S. News and World Report ranks Stevenson #86th in Regional Universities North and 45th in Best Value Schools. Stevenson University offers a flexible and affordable online Master’s in Healthcare Management with a Project Management concentration. This healthcare project management master’s is specifically geared towards working professionals currently employed in the healthcare field, preparing students with the strategies, tools, and skills to assess and manage healthcare organization projects from initiation to execution. Students also have the option to pursue a concentration in Quality Management and Patient Safety, learning to plan, organize, and lead efforts to improve the effectiveness of patient treatment. Courses blend theory and practical application, using case study method and other problem-solving integrative methodologies, and all are taught by practicing healthcare managers. The 36-credit hour online master’s degree includes courses such as Innovative Leadership & Management, Teamwork in Healthcare Settings, Healthcare Project Planning and Management, and Project Management Accounting. Tuition is affordable at $670 per credit, and a full 84% of students receive financial aid, the second-highest of any school surveyed here. Graduation and retention rates are high, at 53% and 75% respectively. With an outstanding balance of flexibility, affordable tuition, and strong academics, Stevenson takes the #1 spot in our ranking of 10 Best Master’s in Project Management with Healthcare Concentrations. The University of Scranton is a private, not-for-profit, Roman Catholic research university which is located in Scranton, Pennsylvania. Scranton was established as St. Thomas College in 1888 by the first Bishop of Scranton, and became a full university in 1938. It is is served by the Scranton Jesuit Community, and is one of 28 schools belonging to the Association of Jesuit Colleges and Universities. Scranton has a total enrollment of 5,422, and awards 65 Bachelor’s Degrees, 29 Master’s Degrees, 43 Minors, and 38 Undergraduate Concentrations, as well as a Doctor of Physical Therapy Program and a Doctor of Nursing Practice. All degree programs integrate a core curriculum with a the liberal arts approach, providing students with well-rounded skills in critical thinking, writing and public speaking, and in keeping with the school’s Jesuit tradition, emphasize ethics and social responsibility. A unique Business Leadership Honors Program is open to students from all disciplines, and develops leadership skills through special seminars and courses in management, ethics, strategy and analysis. The school has an excellent job placement rate of 97% and law school acceptance rate of 95%. U.S. News and World Report awards Scranton top rankings- 6th in Regional Universities North and 18th in Best Value Schools. The University of Scranton awards an Online MBA with a Specialization in Healthcare Management based around interdisciplinary core business competencies and technology-enhanced management skills. The course of study consists of 36 credit hours, and a flexible curriculum includes the option to select several elective courses related to the field of healthcare management. All students are required to complete a business core of 12-21 credits, as well as cornerstone and capstone courses. Classes in the Healthcare Management specialization include Health Care Law, Hospital Administration, Global Health Management, Introduction to Health Informatics, Health Services and Systems, and Healthcare Financial Management. Tuition costs $940 per credit, and no less than 88% of students receive financial aid, the highest of any school surveyed for our ranking of Best Master’s in Healthcare Project Management. Class sizes are exceptionally small, with a student to faculty ratio of 12 to one, and high retention and graduation rates further attest to the outstanding academic quality of Scranton’s online master’s program. American University (AU) is a private research university affiliated with the United Methodist Church, which is located Washington, D.C. American was chartered in 1893 and opened for classes in 1914, with a starting class of just 28. Today, American has a total enrollment of 13,200 undergraduate and graduate students. The university comprises seven academic divisions, including School of International Service, School of Public Affairs, School of Professional & Extended Studies, and the Washington College of Law. American’s central location in the nation’s capital makes it an exceptional destination for students interested in public affairs, international studies, public service, and global commerce, and students can participate in a broad range of government, business, and nonprofit internships. Over 70 percent of undergraduates also choose to study abroad. The 84-acre urban campus of this progressive school is the nation’s most carbon-neutral. U.S. News & World Report ranks American 74th in National Universities and 66th in Best Value Schools. American University administers a top quality online master’s in Healthcare Management. The degree content has high workplace relevancy, as the curriculum is aligned with a number of external healthcare management educational standards of excellence, and was developed with input from industry leaders and a council of healthcare experts from leading organizations, such as the United States Department of Health and Human Services (HHS), and the Office of the National Coordinator for Health Information Technology. In addition to specific healthcare management coursework, the curriculum integrates skills in communication, teamwork, ethical decision-making, innovation, and emerging technologies. The degree consists of 30 credits, and is offered in an accelerated format of 10 eight-week classes, which can be completed in 20 months. Courses are project-oriented, and emphasize data analysis, evaluation, and presentation. Topics include Standards and Systems in U.S. Healthcare, Principles off Health Information Technology, Healthcare Management Capstone. Academic quality is exceptionally strong in they program; classes are very small, thanks to a student to faculty ratio of just 12 to one, and 94% of instructors hold a terminal degree. American has the highest retention and graduation rate of any school in our ranking of Best Online Master’s in Healthcare Project Management, at 90% and 81%. This prestigious and high quality online master’s is priced at $1,345 per credit. The University of Arizona (UA) is a public research university located in Tucson, Arizona. The school was established in 1885, and actually predates the founding of the state itself, as the first university in the Arizona Territory. Today, UA has a total enrollment of 43,625 and awards bachelor’s, master’s, doctoral, and professional degrees. Popular areas of study include business and management, biology, and social sciences. The institute comprises 19 separate schools and colleges, including a College of Medicine in Tucson and Phoenix and a College of Law. UA is also affiliated with two academic medical centers. The university is the only school in Arizona to belong to the elite Association of American Universities. UA has selective admissions and rigorous academics, and as vey active in research. It is recognized by the Carnegie Foundation as a research university with “very high research activity,” and conducts a great deal of research for NASA. UA is ranked 124th in National Universities by U.S. News & World Report and 60th in Top Public Schools. The University of Arizona offers a flexible online master’s in healthcare management through its highly ranked Eller College of Management. The program incorporates immersive, project-based experiences, and blends studies in the foundation of business (accounting, economics, finance, marketing) with studies in the foundation of healthcare (information technology, management). Students pursuing this online master’s can opt to concentrate in any of three different areas: Healthcare Leadership, Healthcare Innovation or Healthcare Informatics. This reputable program costs $1,000 per credit, and 68% of students receive financial aid. The student to faculty ratio is 20 to one, and both retention rates (80%) and graduation rates (60%) are high, indicating high student satisfaction. Southern New Hampshire University (SNHU) is a private, nonprofit institution based Manchester, New Hampshire. SNHU was founded in 1932 as a for-profit school of business, the New Hampshire School of Accounting and Secretarial Science. The school became a nonprofit in 1968, and a full university in 2001. Today, SNHU has an enrollment of 73,177, of whom the majority (about 60,000) are enrolled exclusively in online programs. Professional relevancy is emphasized at SNHU, and degrees programs are developed to align with industry standards and build in-demand job skills. The school is also known for innovation, having been the first campus in the state to go carbon-neutral and launched professional-preparation centers including a simulated stock trading room and an award-winning, student-run restaurant. U.S. News and World Report places it 101st in Regional Universities, North, as well as 83rd in Best Value Schools, and 1st in Most Innovative Schools. Southern New Hampshire University offers a respected Online Master’s in Management with a concentration in Healthcare. The degree present students with up-to-date practices and skills within the healthcare industry, in the context of business foundations, including effective business communication; project management; organizational culture and brand; leadership; strategic planning; and talent support and development. The curriculum is made up of 12 courses, totaling 36 credits: seven core management courses, four healthcare concentration courses and one capstone course. Class titles include Healthcare Information Management, Healthcare Reimbursement Systems and Finance, Strategic Human Resource Management, Healthcare Quality, and Human Behavior in Organizations. The entire course of study can be completed in as little as 15 months, with two courses per 10-week term. Tuition is affordable at $627 per credit, and 54% of students receive financial aid. Colorado Technical University (CTU) is a private institute which is located in Colorado Springs, Colorado. CTU dates back to 1965, when it was established as a technical school dedicated to training veterans in technical and vocational subjects. Nowadays, the university awards degrees at the undergraduate, graduate, and doctoral level, and has a total enrollment of 25,797. Career-focused studies are a school strength, and popular programs include Accounting, Business Administration, Computer Science, and Health Sciences. The school’s popular online learning programs account for no less than 92% of students, a large proportion of whom are active or former members off the military. CTU has been ranked three times as #1 Best for Vets in the category for online and non-traditional universities by Military Times magazine. U.S. News and World Report has given high rankings to several of the university’s online degree programs, including 34th in Best Online Graduate Criminal Justice Programs, and 67th in Best Online Graduate Engineering Programs. Colorado Technical University offers an online Master of Science degree in Management with a concentration in Healthcare Management. The program provides a comprehensive foundation in contemporary workplace issues relevant to the field, including managerial, organizational, ethical and marketing topics. The course of study consists of 48 credit hours: 28 hours in the business core and another 20 hours in Healthcare Management concentration classes. Courses within the concentration include Managing the Healthcare Organization, Quality Improvement in Healthcare and a Healthcare Management Capstone course. With the vast majority of its students enrolled in distance learning programs, CTU excels in online support services, and distance learners can take advantage of resources including a virtual library, online academic advising, real time tutoring, and orientation videos. CTU’s innovative, student-centered learning format allows students to select their content delivery based on learning style, opting for audio, visual or exercise-based learning modules. In addition, students can, with approval, earn credit through prior coursework, life experience, an Experiential Learning Portfolio, military training or experience, professional training or certification, or through standardized assessments. Tuition is very affordable at $585 per credit, and 71% of students also receive financial aid. Southeast Missouri State University (SEMO) is a public university based in Cape Girardeau, Missouri. SEMO got its start back in 1873 as the Southeast Missouri State Normal School, becoming a college in 1919 and a full university in 1973. Today, SEMO is among the fastest growing universities in the Midwest, with a current enrollment of 11,502, and remains strong in its original field of teacher training. The university offers more than 200 areas of study, including undergraduate and graduate degrees as well as a cooperative Ed.D. program with the University of Missouri. Students from all disciplines can take advantage of internships and experiential learning opportunities, along with study-abroad opportunities ranging from two-weeks long to a full academic year. U.S. News and World Report ranks the university 93rd in Regional Universities Midwest and 23rd in Top Public Schools. Southeast Missouri State University awards a flexible and very affordable online Master’s in Healthcare Management through its Harrison College of Business. The program consists of just 30 credit hours, and no capstone course is required for graduation. Students complete a healthcare core consisting of 6 three-credit classes, then select one of five available 12-credit concentrations: General Healthcare, Administration, Informatics, Quality and Patient Safety, or Communication. Class topics include Applied Human Resource Management, Management of Health Systems, Research Methodology in Healthcare, and an Applied Research Project in Healthcare. At a cost of just $347 per credit, this degree is the most affordable of any school surveyed for our ranking of Best Master’s in Project Management in Healthcare, and a full 70% of students also receive financial aid. Wilmington University is a private, non-profit, research university located in New Castle, Delaware, and operates 14 additional satellite campuses throughout the state as well as New Jersey, and Maryland. Wilmington was first established in 1968 as Wilmington College, with a charter class of just 194 students. Today, Wilmington has a total enrollment of 20,522 diverse undergraduate, graduate, and doctoral students, and offers almost 100 degree and certificate programs. The most popular areas of study include Behavioral Sciences, Business Administration and Management, Criminal Justice, Nursing, and Psychology. Wilmington offers a generous transfer credit policy and many of its students are enrolled in degree-completion programs. U.S. nNews and World Report gives top-200 rankings to several online programs at Wilmington, including 118th in Best Online Graduate Nursing Programs, and 120th in Best Online Graduate Business Programs (Excluding MBA). Wilmington University awards an exceptionally affordable online masters in management with a concentration in healthcare management. The program is designed to equip students with comprehensive training in leadership, decision making and problem solving in a healthcare organization context. Online master’s degree candidates must complete an18-credit hour Business Management core, a 12-credit hour concentration and six elective credits. Courses within the Healthcare management concentration include Health Insurance and Reimbursement, Legal Aspects in Health Care, Marketing in the Health Care Sector, and Organization Theory and Design. At $477 per credit, Wilmington has the second-lowest tuition of any school surveyed for our ranking of the Best Online Master’s in Project Management in Healthcare. Class sizes are also exceptionally small, thanks to a university student to faculty ratio of 13 to one. American InterContinental University (AIU) is a private university located in Schaumburg, Illinois, with additional campuses in Atlanta, Georgia and Houston, Texas. The university also operates a popular online division offering distance degrees. AIU was established as the American Fashion College of Switzerland by an American couple in Lucerne, Switzerland in 1970. The institute quickly branched out by adding courses in business to its fashion training, and by 1996 had taken its current name and range of academic programs. Nowadays, AIU awards associate, bachelor’s, and master’s degrees, offering a range of professionally-oriented programs and an open admissions policy. AIU has a total enrollment of more than 15,000, of whom 80% are enrolled entirely online. AIU Online was ranked among Computerworld Honors Program’s “Best of the Best” for 2009. Popular areas of study include such career-focused disciplines as business, IT, education, healthcare management, criminal justice, and media production, and has an open admissions policy. American InterContinental University awards a highly accelerated online master’s in healthcare management. The in-depth and industry-focused curriculum incorporates studies in global, historical, and organizational and perspectives, including law, marketing, business, government, finance, accounting, ethics and technology. The degree requires the completion of 48 credit hours, and can be completed in just one year. The intensive curriculum covers Healthcare Administration, Healthcare Leadership and Management, and Healthcare Strategies. The program concludes with a Capstone in Strategic Management for Healthcare, in which students analyze healthcare workplace situations and develop problem-solving strategies. All courses are taught by accomplished healthcare management professionals who bring real-world perspectives into the classroom. This fast-paced online masters in healthcare management is available for just $600 per credit, and 70% of students all receive financial aid. The Colorado State University–Global Campus (CSU-Global) is a fully online public university which is a member of the to the public Colorado State University System. CSU Global is based in Greenwood Village, Colorado and offers classes entirely in an online format to distance students. 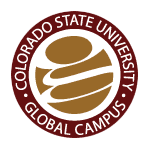 CSU Global was established in 2007 as distance education division within the Colorado State University System, and became a fully independent university in 2009. CSU Global has the distinction of being “the first statutorily-defined, non-profit, online state university.” The school awards 14 different online bachelor’s degrees with 25 undergraduate specializations, and 12 master’s degrees. All bachelor’s are offered as degree-completion programs, allowing students with credit from undergraduate classes, life and work experience, CLEP, and military training or experience to earn credit towards an undergraduate degree. Colorado State University Global offers an online Master’s in Project Management with a concentration in Healthcare Administration, as one of 15 possible specializations. Other concentrations offered include International Management, Organizational Leadership and Change Management, Organizational Learning and Performance, and Strategic Innovation and Change Management. The degree is accredited by the Project Management Institute Global Accreditation Center for Project Management Education Programs (GAC). CSU Global’s online master’s in project management in Healthcare Administration program prepares students with an in-depth understanding of best practices for effective supervision and decision making in the healthcare field. A total of 36 credits are required for the master’s degree, and the Healthcare Administration concentration consists of 4 three-credit graduate online healthcare administration courses. Class topics include Quality and Performance Improvement in Healthcare, Operations Management in Healthcare Organizations, and Healthcare Finance. The curriculum of the project management master’s program is aligned with the Project Management Institute’s Body of Knowledge (PMBOK) and is designed to prepare students to sit for the Project Management Professional (PMP) certificate exam. This flexible and comprehensive online master’s in project management healthcare is highly affordable, with tuition set at $500 per credit, and 32% of students also receive financial aid.